GOPAC Oceania, with the support of the United Nations Development Program, welcomed legislators from Cook Islands, Solomon Islands and Tonga, and members of GOPAC Australia and GOPAC Kiribati at a regional meeting in Rarotonga, Cook Islands in February. The meeting enabled the Oceania region to build the capacity of parliamentarians to support anti-corruption programs both in their countries and in the region with a specific focus on the United Nations Convention Against Corruption (UNCAC) and parliamentary oversight. Cook Islands Prime Minister Henry Puna opened the event. In his remarks he highlighted that Cook Islands signed the United Nations Convention Against Corruption (UNCAC) in 2011 and that the countryâ€™s legislators are committed to strong public accountability and oversight. At the end of the second day, legislators from Cook Islands formed a new national chapter. Just shy of 75 per cent of the countryâ€™s legislators joined GOPAC Cook Islands and committed to a strong fight against corruption at home and abroad. Nandi Glassie will lead the chapter as Chair with the help of Vice-Chair Tetangi Matapo. Joining them are Treasurer Selina Napa, Secretary Mona Ioane, and Board Member John Mokoenga Henry. 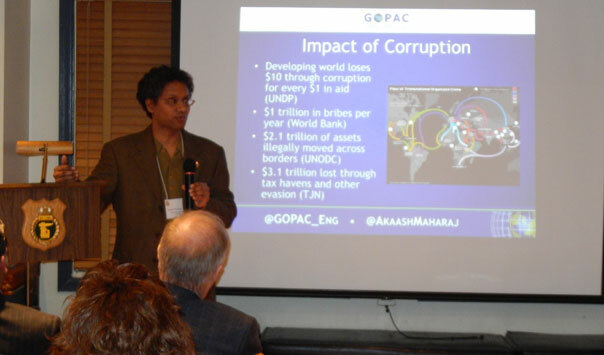 GOPAC Executive Director, Akaash Maharaj, presented at the Governance Speakers Series event held in Ottawa, Canada at the beginning of February. The event was hosted by the Ottawa chapters of the Monarchist League and Royal Commonwealth Society. It drew a full house including representatives from GOPAC Canada, parliament, media and the public service. Mr Maharajâ€™s presentation provided insight on addressing corruption, power influences and transparency in various systems of governance. He also spoke on GOPAC's research on this issue in various governance structures. He also drew on his recent interactions with our various chapters and partners to provide lessons learned and best practises on how to reduce parliamentary corruption in Canada and around the world. Do you believe that the impact of corruption in your country is felt more severely by women than by men? The United Nations Global Compact invited GOPAC to participate in their CEO Roundtable on corporate sustainability, 19 February, in Accra, Ghana. The event was hosted by the Ghana chapter of Global Compact and the Ghana Chamber of Mines and brought together over 50 industry leaders from the banking, mining and manufacturing sectors amongst others. The Honourable Emmanuel Kwasi Bandua, Vice Chair of APNAC-Ghana and the Honourable Joseph Osei-Owusu, member of APNAC-Ghana, participated on behalf of GOPAC. Also in attendance were Daniel Batidam, Executive Director of APNAC and Fabrice Fifonsi, Program Officer at the APNAC Secretariat. The discussion focused on the realities of integrating global standards of corporate sustainability into the Ghanaian economy. The lack of a strong supportive enabling environment was cited as a huge stumbling block to the consistent integration of corporate sustainability frameworks, such as the UNGC, by business in Ghana and across Africa. Participants challenged the widespread business stance that corporate social responsibility is an external cost to core business function. They suggested the need for coordinated efforts, in partnership with well-established Multi-National Enterprises, to raise awareness and build capacity of companies, particularly SMEs, to deliver on their commitments to corporate sustainability through the UN Global Compact. The need for African businesses to take their place at the frontline of the discussions about corporate sustainability in Africa is increasingly evident. Country-specific challenges in the business environment across Africa are not often understood by western investors leading to negative misconceptions. Corporate sustainability platforms such as the UN Global Compact encourage good corporate citizenship, building a stable investor platform and enhancing long term business sustainability in Ghana and across Africa. 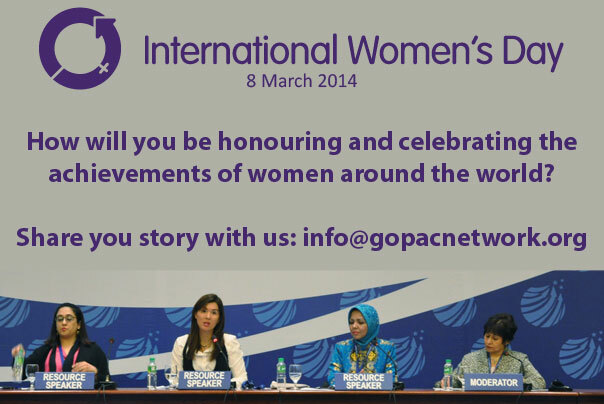 GOPAC became an official participant in the United Nations Global Compact in January. The initiative, with over 10,000 participants in 145 countries around the world, is a leadership platform for the development, implementation and disclosure of responsible and sustainable corporate policies and practices. In joining the initiative, participants commit to ten universally accepted principles in the areas of human rights, labour, environment and anti-corruption. The GOPAC Audit Committee held its first meeting of the new year on 11 February. The Audit Committee, first established in the autumn of 2013, is part of GOPACâ€™s commitment to ensuring accountability and good governance from within the organization. We believe that every organization should lead by example. All members of the committee were present for the meeting and the Audit Committee Chair, Fernanda Borges of GOPAC Timor-Leste, welcomed Akaash Maharaj, GOPACâ€™s Executive Director, and Emilie Lemieux, the Global Secretariatâ€™s Officer Manager. Members met to review GOPACâ€™s external financial audit report. The report along with a letter of recommendation from the committee will now been sent to GOPACâ€™s Executive Committee for final approval.